A signature is as unique as a fingerprint. It represents us even in our absence. And that’s why it is an important part of us. Graphologists normally analyse a person’s signature along with his handwriting in order to decode his personality and character. But the two are very different, and they’re analysed differently. While handwriting betrays the writer’s true personality, his signature reveals how he wants the world to perceive him. Every time you sign something, you make a statement to yourself and to the rest of the world, saying: “This is who I am.” Here, graphologist Vishwas Heathcliff deciphers the signatures of six stalwarts from India Inc. The straight signature reveals that the RIL Chairman and Managing Director is a man who has a good head on his shoulders. He keeps his cool even in crises and endures trying circumstances. He does not allow his emotions to interfere with his decisions and relies consistently on his mind for directions. Heart has very little role to play in his day-to-day life and impulsiveness is absolutely out of the question. However, he has a limited stock of patience. The cup-like formations in the connections between letters in the signature show Mukesh is overburdened, that some of the things currently going on in his life are getting him down. The size of the first letter in the signature testifies that he is a man with full faith in himself. And he likes to tell the world that he is the best at what he does. The size of his signature and the absence of diacritics (marks added to letters) indicate that Mukesh hates paying attention to details. Mostly, he likes to skim through things. Well, as the Chairman and MD, it behoves him to pay more attention to the larger picture rather than every single detail. He depends heavily on the suggestions of his think-tank before making decisions. Mukesh readily believes people around him and he is prone to be misled because he thinks really fast—often without feeling the need to stop and cross-check. Deep down, Mukesh often feels the big family name he carries has stifled his growth as an individual. He can’t imagine himself as just Mukesh; he has to be an Ambani. I can’t say whether he believes in God, but he likes to associate some significance to religious values. He is self-conscious and is concerned about what people say about him. If Anil Ambani is your boss: Never pry into his private life. He likes to maintain his privacy and won’t like it if anyone intrudes. 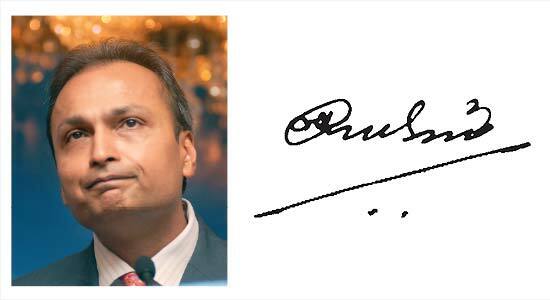 The right slant of his signature reveals that the ADAG (Anil Dhirubhai Ambani Group) Chairman is an impulsive person. The man is driven by the heart. Remember those long, emotional emails he wrote to his brother before the division of the empire? Under extreme emotional pressure, Anil may find it difficult to stop himself from breaking down—but only in private. He is easily moved by a heartrending story and may make decisions on impulse. Now, notice the circle around the first name of his signature. The circle, which camouflages the first name, shows he gets very defensive in public. Such writers have a problem making friends from their own field because they do not open up and are always scared of getting hurt. Understandably, Anil has more friends outside the corporate world. Anil feels he is misunderstood by his own people and therefore likes to keep his opinions to himself. More often than not, he fears that others don’t understand him. He feels betrayed and gets hurt easily. Since childhood, Anil has consistently found someone in his life who dominates him. By looking at the signatures of the two brothers, it’s clear that the elder brother made the younger one feel less important. 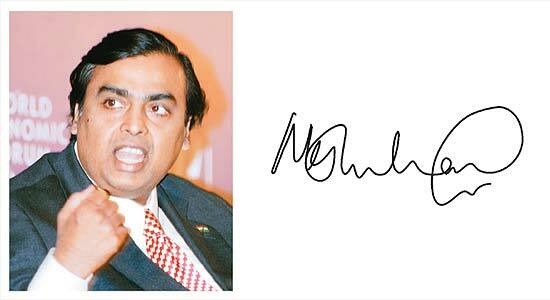 Here’s a simple exercise: place Mukesh’s signature over Anil’s. You’ll notice that the elder brother’s signature completely overshadows the younger’s signature. Anil, here’s a small suggestion: enlarge the ‘A’—the first letter of your name—in your signature. Write your full name and surname and retain the underline below. The results may surprise you. 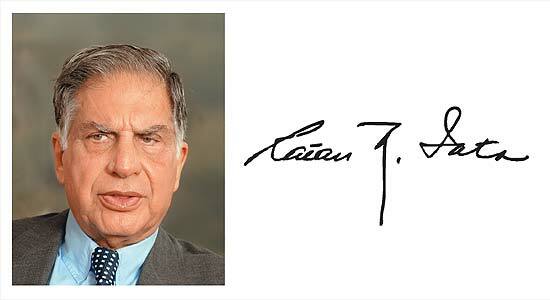 If Ratan Tata is your boss: Make sure you become a part of his persistence and determination. Avoid suggesting an easier route because once he has made up his mind, it’s unlikely he will change it. This man has exemplary persistence. Notice the long down stroke in the ‘N’—the first letter of his middle name. The longer the stroke below the baseline, the more enduring the determination. The heavier the stroke, the more forceful and strong the persistence. If the down stroke is short, the writer’s determination lasts for a short while. But if it is as long as Tata’s, the writer’s determination is long-lasting. The Nano is a shining example of this: it was launched many years after he made the promise and despite all the hurdles Mamata Banerjee created for him in Bengal. Tata’s signature also shows that he has a hidden strength that makes him all the more determined in the face of obstacles. At first, it may appear he is going to bend when pushed, but the rougher the situation, the more determined Tata is to see it through to the finish. Now, look at the floating t-bar in Ratan. Such a stroke in handwriting indicates that the writer is a dreamer, and that he dreams the impossible. He has a great deal of energy and can carry on through the day without much fatigue. He also has an amazing memory and a very good sense of colour. Ratan Tata is a very emotional person. Yes, he feels very strongly about everything. But he never expresses himself on impulse. He has amazing control and full faith in what he is doing (notice an impeccably straight baseline in “Ratan”). This unwavering baseline indicates the writer has good willpower and handles unexpected situations without getting distracted and finds a way around obstacles. 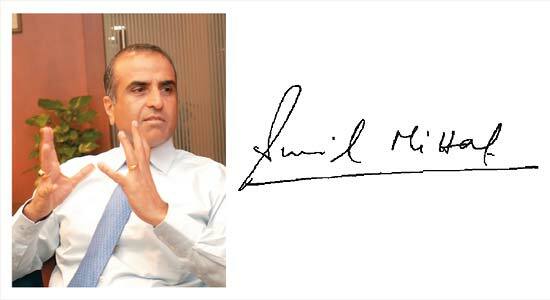 If Sunil Mittal is your boss: Keep in mind that you cannot afford to be slow because he is always in a hurry and extremely impatient. He likes to see things done quickly, or else he will lose his temper. Enterprises, is generally a level-headed guy, but he loses his cool over things that do not really warrant such an extreme outburst. Often, he himself ends up wondering if such a reaction was really necessary. Notice that the last letters in his name and surname drop. This drop suggests that Sunil was a bit unhappy about something at the time he crafted this signature. Could it be a below-average quarter? Maybe. Whatever it was, he was really stressed out over something. The drop indicates that he was dismayed and dispirited about the way he was handling his affairs. But if the drop at the end of the words is a regular feature, it means he is continuously fighting feelings of dejection and loss. Sunil is a quick, sharp thinker and he likes to be busy all the time. He cuts to the chase and gets to the point immediately. In public, he is humble and down-to-earth. He hardly gets pushed around. However, when he faces a big challenge, he likes to lie low and go slow. In his own words, he displayed such behaviour when the country’s biggest business house (Reliance) became his competitor in 2003. It was Sunil’s decision to lie low and wait for the dust to settle. It worked. Today, he is still No.1 in the telecom industry. If Kumar Mangalam Birla is your boss: Make sure that when he gives you gyaan, you listen to him attentively and express some interest in philosophy and spirituality. 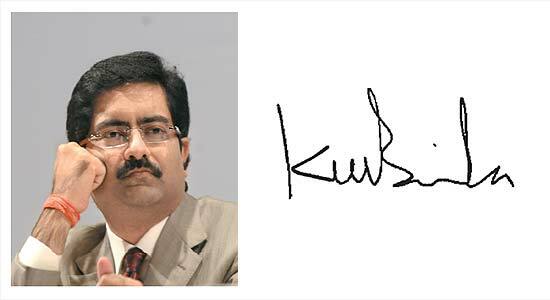 Very few people might know that the suave, formal and elegant Chairman of the Aditya Birla Group is a very talkative person. However, his loquacious side is known only to a few close people. Sometimes, he finds himself offering suggestions without being asked for them. He likes to spend most of his time searching for the philosophical significance of life. He likes intellectually stimulating conversation and you will often hear him talking about philosophy and the meaning of life. In fact, most of his decisions are driven by philosophy and a desire to contribute to spirituality. Kumar is often inclined to think that many around him are intellectually starved and that their lives might be better if they leant towards spirituality. Some people call him arrogant, but I would not pass any value judgment here. He likes to follow a path that enables him to makes decisions that are in the larger interests of humanity. That extreme upper zone represents the authoritarian personality whose motto could be “do as I say, not as I do”. He has had extremely strict, often hyper-religious, fathering and he is always trying unconsciously to please that father. In addition, the tall upper zone speaks of scholarly and philosophical pursuits, and the idealist who expects perfectionist standards of himself. Kumar has a poor social life and often escapes into the intellectual world. He thinks socialising is a total waste of time. The narrowness and twist in the upper zone indicates he resists new ideas and philosophy and likes to stick to the ones he has experienced already. As a child, Kumar has seen figures of authority as extremely powerful, in fact, towering over him. That may be the source of the extreme reverence he shows towards elders. 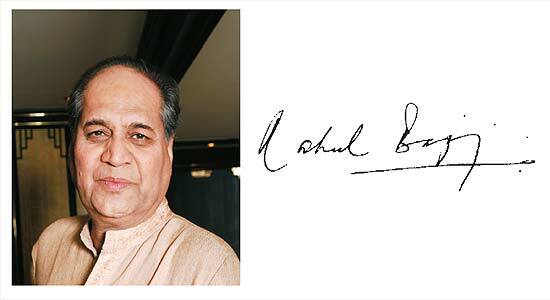 If Rahul Bajaj is your boss: Do not get into any arguments with him, because he likes to believe his words are final. If you need to present an idea that goes against his, send him an email rather than meet him in person. Whatever this man does, he needs no approval from most others. The period after his name implies he has said all that there is to say and no more dialogue will be entertained. The large initial letter standing so far away from the rest of his name suggests that he has an enormous ego, but seems to have it under control. The illegible, ambiguous, distorted signature shows he is hard to get to know because he allows only a few people to get close. He is utterly secretive, has uncontrollable drives and wants continuous attention. However, the man prefers to be left alone. The “x” formation created by the underline and the down stroke is accidental here, not deliberate. Although the “x” does imply inner worries, I would say that these are more petty annoyances because of his status. It also indicates his tendency to ruminate over his past mistakes and ignore his good deeds. In private, Rahul thinks more about the wrong decisions he has made. The wide gap between his name and surname indicates that he has had issues with other members of his family. Mostly, the problems arise because he thinks people don’t understand what he means. But, according to his signature, the main issue here is that he is not communicating properly. Rahul is moody. Some days he loves people, and others, he keeps away from them. An interesting thing about Rahul is that he often finds his patience petering out as he heads towards the end of a project.